There exists a significant body of work in the theory of checking experiments devoted to test generation from FSM which guarantees complete fault coverage for a given fault model. Practical applications require nevertheless methods for fault-model driven test generation from Extended FSMs (EFSM). Traditional approaches for EFSM focus on model coverage, which provides no characterization of faults that can be detected by the generated tests. Only few approaches use fault models, and we are not aware of any result in the theory of checking experiments for extended FSMs. 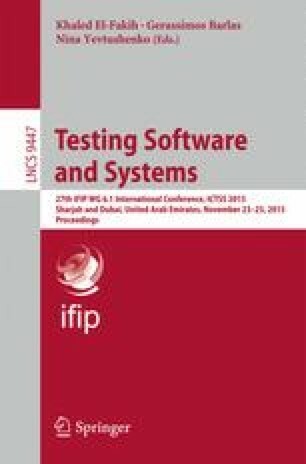 In this paper, we lift the theory of checking experiments to EFSMs, which are Mealy machines with predicates defined over input variables treated as symbolic inputs. Considering this kind of EFSM, we propose a test generation method that produces a symbolic checking experiment, adapting the well-known HSI method. We then present conditions under which arbitrary instances of a symbolic checking experiment can be used for testing black-box implementations, while guaranteeing complete fault coverage. The first author acknowledges financial support of NSERC via Discovery grant RGPIN/194381-2012. The second author had financial support of Brazilian Funding Agencies, CNPq, Capes and grant 2015/17753-7, São Paulo Research Foundation (FAPESP).